The new Lotus team are closing on a deal to switch to Renault engines next year, BBC Sport understands. Lotus team principal Tony Fernandes and technical director Mike Gascoyne had a meeting with Renault on Sunday morning at the British Grand Prix. Both sides are keen on a deal, which is expected to include road car tie-ins. Gascoyne refused to comment on Renault but said: "We have a contract with Cosworth and we're discussing with them ways to work together in the future." Ayrton Senna and Nigel Mansell are among the drivers who have previously raced Renault-powered Lotus cars in Formula 1. Will this help Lotus to improve next season? The team ran the engines from 1983 to 1986, winning five races. Lotus, who are the most competitive of the three new teams on the grid this season, currently use Cosworth engines. 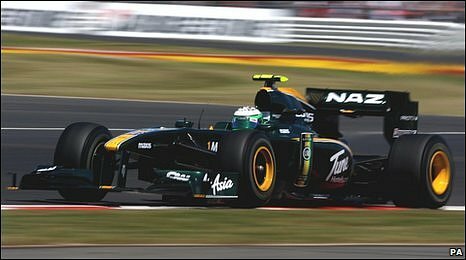 The new Malaysian-backed team brought the Lotus name back into F1 for the first time since 1994, when Team Lotus collapsed because of financial reasons. The new team is called Lotus Racing but BBC Sport understands they are close to finalising a deal with the owners of the Team Lotus brand to reinstate the historic name. The new Lotus team is already being treated by F1 authorities as a continuation of the former one, which was set up by the legendary Colin Chapman, earning prize and appearance money on the basis of Team Lotus's historic results.